Let’s check out the Kpreps Rankings to see how things stand as we prepare for state semifinal action this week. Derby reached the state semifinals for the fourth consecutive season with a 38-7 win over Topeka High. The Panthers scored 38 straight points after falling behind the Trojans by a touchdown after the first quarter. Defending champion Blue Valley North moved up three spots to No. 2 after a 49-28 victory over previously-unbeaten Gardner-Edgerton. Quarterback Graham Mertz threw six touchdown passes and receiver Cameron Burt set the state record for single-season receiving yards with 1,576. Manhattan moves back into the poll at No. 3 after a dominating 41-19 win over then No. 2 Lawrence Free State. Senior back Kevontae McDonald rushed for 237 yards and six touchdowns and the Manhattan defense held Free State to just 87 yards of total offense. Free State dropped to No. 5 in this week’s poll and Bob Lisher, the only coach in school history, announced his plans to retire at the end of the year. Olathe North moves back in the poll at No. 4 after the Eagles eliminated Shawnee Mission East, 24-21. The Eagles scored a touchdown in the fourth quarter to deliver the victory. Senior Daymonn Sanchez rushed 39 times for 258 yards and a score. Top-ranked St. Thomas Aquinas defeated Eastern Kansas League rival Mill Valley for the second time this season. The Saints won 30-7 as sophomore Tyron “Tank” Young rushed for 136 yards two touchdowns. The Saints defense held No. 5 Mill Valley to 105 yards of total offense on the night. In two games against the Saints, the Jaguars did not rush for positive yards. In one of the wildest games of the season, No. 2 Wichita Northwest outscored No. 4 Bishop Carroll 84-67. Northwest rushed for 690 yards and 11 touchdowns in the game, led by Breece Hall’s 366 rushing yards and six touchdowns on 32 carries. Northwest led 28-20 after the first quarter, 49-34 at halftime, and 63-48 after three quarters. Bishop Carroll third-string quarterback Aiden Niedens threw seven touchdown passes in the game. Third-ranked Maize matched its deepest playoff run in school history with a 28-21 win over Great Bend. In a showdown of two of the classification’s top quarterbacks, Maize senior Caleb Grill passed for 273 yards and two scores, while Great Bend’s Koy Brack passed for 310 yards and two scores. Bishop Miege jumped out to a 27-0 lead on Louisburg in the first quarter en route to a 55-21 victory. Sam Pedrotti passed for 172 yards and three touchdowns and the Stag defense limited the Wildcats to less than 70 yards of total offense. McPherson rolled to a 62-28 win over Arkansas City. The second-ranked Bullpups ended the Bulldogs’ Cinderella run behind 227 rushing yards and five touchdowns from Jace Kinnamon. Quarterback Kyler Hoppes added 229 passing yards and four scores. Goddard into the No. 3 this week after winning at Wellington, 28-14. Ben Bannister scored twice to break a 14-14 tie against the Crusaders. Wellington led 14-0 at halftime. Pittsburg comes in at No. 4 this week, while Basehor-Linwood enters the poll at No. 5. The Bobcats knocked out Paola 28-7 behind 267 passing yards and three scores from Dylan Mussett. Top-ranked Andale rushed for nearly 200 yards and three touchdowns as the Indians defeated No. 5 Scott City, 35-14. The Andale defense held Scott City to only 46 yards rushing on the night. Second-ranked Sabetha scored five touchdowns in the second quarter to run away from Parsons. The Blue Jays beat the Vikings 62-18 to keep their hopes of a second consecutive state title alive. Third-ranked Pratt went on the road and shut out previously-unbeaten Smoky Valley, 46-0. Travis Theis rushed for 206 yards and accounted for six touchdowns. The Greenbacks will host No. 1 Andale this week. Galena moves up to No. 4 this week after an incredible 42-36 double-overtime win at Marysville. Galena fell behind 24-0 before scoring 30 straight points to take a lead late in the game. Marysville scored on the final play to tie the game, but was stopped short on the two-point conversion attempt. Each team scored in the first overtime, but neither could push across a two-point conversion attempt. In the second overtime, Marysville fumbled and Galena scored on fourth-and-goal no a run by JC Shelton. Top-ranked Phillipsburg went on the road and edged No. 2 Conway Springs, 25-24. The Panthers scored on a Treylan Gross touchdown run in the fourth quarter and Jonathan Hunnaccutt added the PAT for the winning points. Humboldt moves up two spots to No. 3 after the Cubs won at Rossville, 24-22. Humboldt is now in the state semifinals for the first time in school history, and will travel to No. 4 Riley County. The Falcons defeated Mid-East League rival Silver Lake, 40-34 in overtime for their first win over the Eagles since 1996. Silver Lake trailed 34-21 with two minutes left before the Falcons scored twice to force overtime. Hoisington enters the rankings at No. 5 after a 30-0 shutout of Hutchinson Trinity. Wyatt Pedigo rushed for nearly 200 yards and three touchdowns in the Cardinals’ victory. Smith Center went on the road and cruised to a 61-27 win over Sedgwick. The Redmen produced three 100-yard rushers in beating the Cardinals. Smith Center will now host No. 3 Plainville in a rematch of a regular-season game won by the Redmen, 21-10. Plainville beat Elkhart, 29-13, behind 120 yards rushing and two touchdowns by Jared Casey. Second-ranked Olpe scored twice in the third quarter to take a 20-6 lead at Centralia, then held on for a 20-18 victory. Centralia scored twice late in the game, but Olpe stopped both of the Panthers’ two-point attempts. St. Mary’s Colgan moves back into the poll this week after a dominating 34-7 win over Jackson Heights. Colgan won the battle at the line of scrimmage as the Panthers rushed for 275 yards and held the Cobras’ Cooper Williams, a 1,500-yard rushing, to 39 yards on 16 carries. The Panthers will now travel to Olpe in next week’s semifinal. Top-ranked Central Plains eliminated defending-champion Hoxie, 54-6, to advance to the state semifinals. The six points allowed by the Oilers were the first points given up since Week 2 – ending a string of eight consecutive shutouts. Central Plains will host No. 2 St. Francis in this week’s state semifinal. The Indians held off No. 5 Hodgeman County, 30-20, on Saturday afternoon. Canton-Galva enters the rankings at No. 3 after a wild 54-52 win at South Central. The Eagles outscored the Timberwolves 20-8 in the second half to force overtime. South Central scored first in overtime, but was unsuccessful on their two-point try. Canton-Galva will now travel to No. 4 Solomon for the other state semifinal. Solomon won at Argonia-Attica, 14-6. These two Wheat State League members were in the same district with Canton-Galva defeating Solomon 38-20 during the regular season. Hanover extended its win streak to 36 consecutive games with a 46-0 win over St. Paul. The Wildcats scored 30 points in the first quarter and advanced to the state semifinal round for the sixth consecutive season. Second-ranked Axtell got on the board quickly as Hunter Koch returned the opening kickoff for a touchdown in the Eagles’ 54-8 win over Waverly. The game was believed to be the last for Waverly coach Mike Hevel who announced plans to retire from the sidelines after the season. Third-ranked Osborne scored 32 points in the first quarter and rolled to a 54-8 win over South Barber. Darnell Holloway threw for two touchdowns and rushed for two more scores in the game. Dighton jumps into the poll at No. 4 this week after a 44-36 victory over No. 5 Otis-Bison. 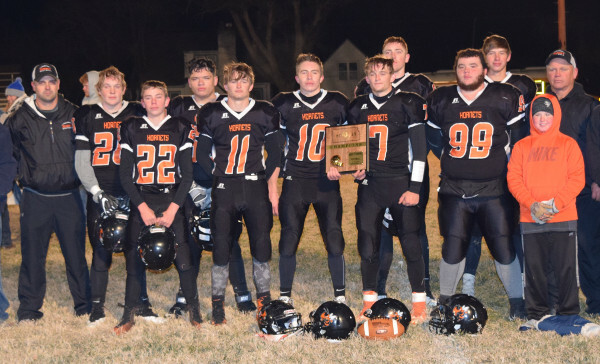 The Hornets have been one of the state’s top stories this season, with just nine players on their roster – four of which did not play high school football last season. The Hornets also created a buzz with an incredible fourth-quarter touchdown catch by David Cramer to help seal the victory over Otis-Bison.